Country Meadows President & CEO Michael Leader reflects on his father’s achievements and goals at Gov. Leader’s 2013 funeral in Hershey, Pa.
During his 95 years, my father, George M. Leader—founder of Country Meadows, Providence Place and Ecumenical Retirement Community—wore many different hats: Naval officer, poultry farmer, State Senator, Governor of Pennsylvania, senior care founder and CEO, husband, father, grandfather and great-grandfather. He was best known as former Governor of Pennsylvania (1955 to 1959), because he was credited with introducing many reforms during his administration. Throughout his life he continued to have an interest in state government. In 2012, he helped to sponsor a major reform to Pennsylvania’s criminal justice system, something for which he had advocated for over a decade. As recently as two months before he passed away, he took part in an initiative by five former governors in support of merit selection of the state’s appellate judges. Among his multi-faceted vocations, the one he enjoyed the most was that of health care entrepreneur and innovator. Dad actually started three organizations that serve seniors: Leader Nursing Centers, Inc., (1962); Country Meadows (1982) and Providence Place Retirement Communities (1998). As governor, my father was especially drawn to serve vulnerable citizens in need of better support. Older adults with healthcare needs were among those who drew his attention. The result was creation of the state Commission on Aging—forerunner of today’s Department of Aging—and annual inspection and tighter regulation of nursing homes. Dad believed that older persons deserved to be treated with dignity and respect. Many, like himself, risked their lives in WWII or Korea to protect our freedom before returning home to help build the strongest economy in the world. Gov. 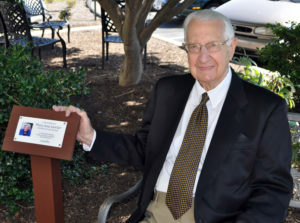 George Leader at a memorial bench for his wife, Mary Jane, at Country Meadows of Hershey. My father not only encouraged others to treat seniors with dignity and respect but also to help them to continue to put purpose in their lives. As someone who went to work every day until three weeks before his death, Dad was a role model for having purpose in life. He loved what he did and liked to remind co-workers that everyone needs a reason to get out of bed in the morning. 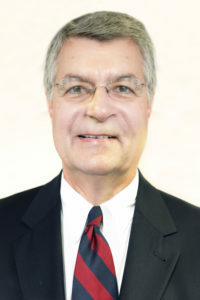 He directed Country Meadows’ Community Life directors and chaplains to find new ways to connect residents with their local community, and then arranged to honor volunteers for their service to others. As a person of faith, he believed that retirement communities should enable residents to exercise not only their bodies and minds but also their spirit. Thanks to this belief, Country Meadows is privileged to employ seminary-trained chaplains who offer spiritual support to residents of all faiths and beliefs. Dad also had a special interest in Alzheimer’s disease. A month seldom went by when he didn’t send me an email or newspaper article about the latest research or preventive program for Alzheimer’s. His initiatives for those with dementia ranged from offering Validation Therapy to giving residents daily multivitamins; from a daily dose of computer games to encouraging the riding of stationary exercise bikes. Not only did he keep current with the latest recommendations, he practiced them himself. Finally, Dad was very proud that his health-care endeavors have always been a family affair. His first partner was his late wife of nearly 7 1years, Mary Jane. Over the next three decades, their children and their son-in-law joined them in the profession. They were thrilled when grandchildren came into the business. Dad’s dream was that the family business he launched more than 50 years ago would continue to enhance quality of life for older adults for at least the next century. This article touched my heart to learn of this great, late, Governor of PA, George M. Leader. His passion and accomplishments are such an asset to the state for older communities. I am so proud of him and you for writing this letter. I recently have been researching facilities for employment and your article of your father’s ideals gave me hope and inspiration again. I had experience working in a county nursing home in the 1980’s, besides two other skilled nursing facilities, and felt many residents didn’t deserve to have to end their days, in some cases, in such poor facility conditions, in addition to being alone in spirit and from their families. It made me so sad at times, but I kept positive, tried to always cheer them up, and truly enjoyed their life stories and life lessons which taught me so much. I have not visited a skilled nursing facility since loosing my parents 5 to 12 years ago. I hope things have improved, I may get the chance during my searching for employment. I know there is a great financial difference between the retirement community and a county or nursing home, but, if we can bridge the ideals, values, and support George stood for to upgrade the services to those of poverty, wow! Thank you for sharing such kind words. We have shared your comments with Mike Leader who will enjoy reading them. You should be pleasantly surprised that skilled nursing centers have come a long way. If you are in the Bethlehem area, we have a skilled community at 4025 Green Pond Road (next to our assisted living community)–we invite you to visit. It truly is the compassionate individuals who care for the residents that make such a difference. And at Country Meadows, Governor Leader created that environment and his family still carries that torch today. Lastly, if you are looking for a career opportunity, please consider our open positions at http://www.CountryMeadows.com/Careers.